Maestro Tailoring & Fashion understands how difficult it can be to find the perfect suit for your wedding day. 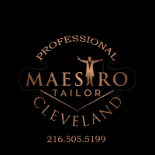 Your search should begin with Maestro Tailor! Whether you are looking for a bespoke or ready to wear suit, Maestro is sure to have the suit you are looking for. Maestro's ready to wear suits brings together style with quality and will be more than happy to help dress your entire wedding party, including the fathers of the bride and groom. Maestro understands that your wedding suit is an investment, and with our 100% wool suits, you will find yourself wearing it time an time again. we will dress you all up!